At the end of January the US heard about a lawsuit that claims Mexican-inspired fast food chain Taco Bell’s meat fillings are only 35% beef. The real problem is the standard by which these products are judged in the first place. The whole upheaval started when newspapers reported about a lawsuit (PDF) filed by Californian woman, who claims that Taco Bell’s seasoned beef doesn’t consist of 88% beef, as advertised by the chain, but rather is a “meat filling” with only 35% beef. When you look into the lawsuit linked above, you’ll find it has an image of one of the company’s internal packaging slips, that in fact don’t refer to “beef” but to “meat fillings”. Yet this quibbling over semantics is not the true problem. We will see if Taco Bell’s statement about 88% beef is true. However, if they had chosen to, their only problem would be if the filling proved to be at 35%. Because the US Department of Agriculture requires a Taco filling to consist of 40% beef. The rest? They can be fillers. And even those 40% may be of questionable quality and the claim “USDA inspected beef” means little, as a USDA spokesman told the Chicago Tribune that the USDA “doesn’t regulate what companies such as restaurants can describe to their customers in advertisements as ‘beef,’ ‘chicken’ or ‘meat'”. 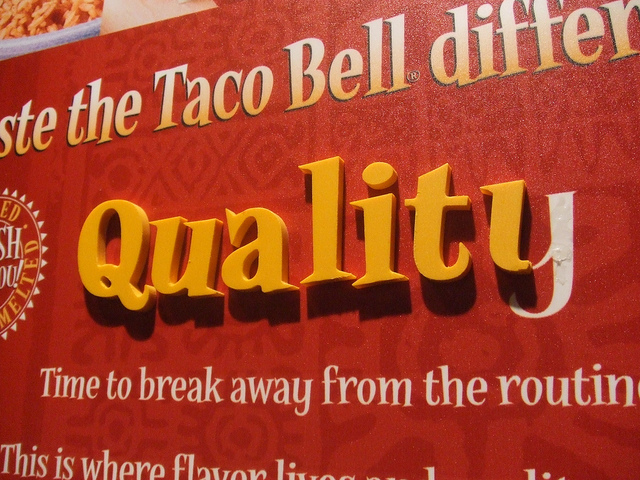 These quality standards are the first part of the real problem. The second is that a lot of people want food cheap, very cheap, and to deliver that, some companies will cut corners wherever they can. It may not be true about Taco Bell, but I do wonder how they can sell the “Cheesy Double Beef Burrito” for 89c , where this price includes the cost for the ingredients, storage and delivery of the product, not to mention it also has to pay its share in the maintenance of restaurants and employee salaries and finally bring in a profit. This doesn’t excuse fast food chains from selling inferior products, but why should they care when most of their customers don’t and when governmental standards are this low? Picture courtesy of Jessie Hodge. next time i want a hot girl ok? lol evil, no offence or anything. But ive never really read any of your posts properly. I only oogle at the girl for about 5 mintues then leave. Thanks for using my picture. Thanks for making it available, Jessie! It proved perfect for the occasion!